Chronic, non-healing wounds require specialized care, but that doesn’t have to mean going to a hospital for recurring treatments. 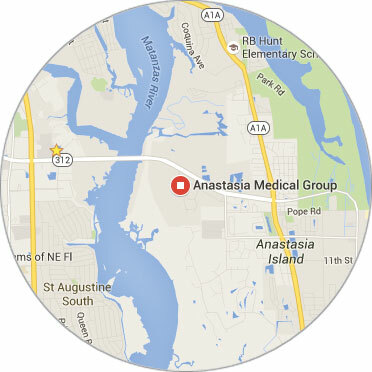 Jacksonville and St. Augustine patients can get the expert wound care they need in Anastasia Medical Group’s comfortable, full-service facility. Dr. Ryan Pereira and his team of doctors take a personalized approach to every treatment. That’s why our patients choose to head to the island. Hospitals are no fun. We get that. That’s why our doctors have the resources and equipment to provide top-notch care within our building. Wound care patients don’t have to worry about being referred to a hospital or specialty facility. Our doctors see you and treat you in our fully equipped, modern treatment facility in St. Augustine. Nobody’s anonymous here. Not our staff, and not our patients. We’re a tight-knit team that works closely together and with each patient to provide the highest standard of care with a personal touch. While we take pride in offering top-notch care including the some of the newest and most innovative procedures available, we also know patients like to be recognized and treated as individuals. One of the most frustrating things about hospitals and large-scale treatment centers is the wait time. Often it seems like appointment times mean nothing. We do things differently here. When you make an appointment with us, we prioritize your time. Our top priority for every patient is to achieve their best possible outcome. That means not just taking a medical history, but also taking into consideration your normal activity level and where you’d like to be following successful treatment. Whether it’s getting a college athlete back on the field or a grandparent back to the beach with the grandkids, your goal is our goal. We’ll use the latest medical procedures available to get you there, and we’ll help you set realistic expectations from the start. Our convenient location is easy to find and offers plenty of parking. No parking garage, tickets, or self-service kiosks here. We’re on beautiful Anastasia Island just off S.R. 312. Take I-95 exit 318 if you’re coming from Jacksonville or exit 311 from the south. Pull up, walk in, and you’re here. If you’re frustrated with the wound care you’re getting elsewhere, schedule an appointment with us. Many of our patients make the short drive from Jacksonville or Daytona simply because they prefer a higher standard of care. It’s an easy drive, and we’re not ashamed to say that St. Augustine is one of the most beautiful cities in the Sunshine State. Join us on the island for your next wound care treatment. ← Can I please get bunion pain relief? ?